Google Maps Streetview for The Woods! 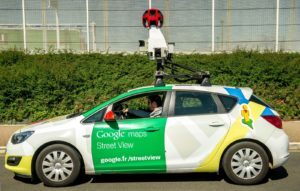 First of all, about three months ago, I was in the house and saw the Google Streetview car driving by the house and about to turn down lower Wall Street. (for those who have never seen this car, it looks like the one here on the left) You cant miss it! So, I see it starting to turn and head down the hill so I shout to Deb “THE GOOGLE MAPS CAR!” and dart out the back stairs thinking Debbie is running behind me because she knows I have been waiting for this moment when we do something hilarious that’s captured on the internet for the rest of time. Unfortunately, I never actually TOLD Debbie my plan. The plan was for her to act like she was choking me and my laying on the ground with arms and legs frozen like I am fighting for my life. Hilarious, right? Well, I was in position and Debbie was on the porch and the car was in picture range. I didn’t know what to do! So, I acted like I was defending my self from something coming out of the sky or…something. That moment is still a blur of confusion ;-). SO, they drive by and Debbie is cracking up asking why I was dabbing. NO WAY, I looked like I was dabbing? I was not dabbing. Here is a pick of someone dabbing..Anyhow, here is a link to the actual google maps link – The Woods on Streetview. It IS pretty cool, you can see alot of the changes we gave done on the property AND you an see Debbie on the Porch. 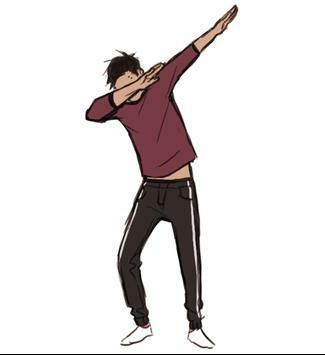 BTW, I am NOT dabbing.